Visit GameStop between January 30th and February 14th to receive a special Pikachu-colored Pichu! Between January 30th and February 14th, head to participating GameStop locations in the United States to receive a unique Shiny Pichu. This Shiny Pichu is a deeper yellow color than most Pichu, and it has bright red cheeks, much like its famous evolved form, Pikachu! 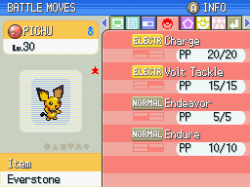 This Shiny Pichu has four awesome moves, including one that a typical Pichu can’t learn. The Charge move boosts the power of of the Electric move it uses next. Volt Tackle is a powerful Electric-type strike that also causes 1/3 the damage to Pichu as the foe received. Endure braces Pichu against a knock-out attack, leaving it with 1 HP. And Endeavor, which is not available to typical Pichu, does enough damage to the opponent to give it and Pichu the same number of HP. It’s a very powerful move, especially when combined with Endure to bring your opponent down to 1 HP! 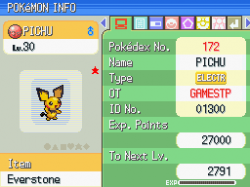 Pichu is also carrying an Everstone to prevent it from evolving. 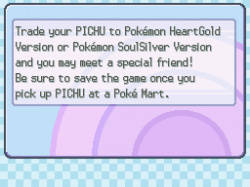 Shiny Pichu holds even more secrets if you transfer the Pokémon to either Pokémon™ HeartGold or SoulSilver Version, launching March 14th. Once you’ve traded Shiny Pichu, take it to Ilex Forest to meet Spiky-eared Pichu, the one featured in the recent movie, Pokémon: Arceus and the Jewel of Life! Be sure to visit your local GameStop store between January 30th and February 14th to get this one-of-a-kind Pichu! 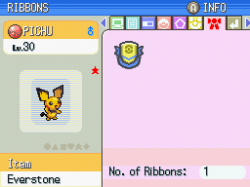 The details for the Pichu are as follows. The OT is GAMESTP. The ID is 01300. 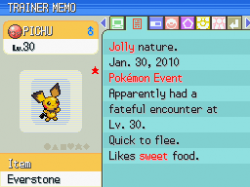 It is level 30, male, Jolly natured, holding an Everstone, and captured in a Cherish Ball. First off it was announced that Gamestop in the US will be distributing Jirachi to Diamond, Pearl and Platinum games from February 27th to Match 13th. The Jirachi will know Wish, Confusion, Rest and a special move, Draco Meteor. It will be Level 5 and holding a Leichi Berry, the nature as always will be randomly chosen. 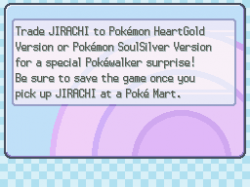 When this Jirachi is transferred to the PokeWalker in HeartGold and SoulSilver, a new Night Sky PokeWalker course will be unlocked. Pikachu Coloured Pichu is currently being distributed in the US until February 14th at Gamestop. When transferred to HeartGold or SoulSilver, this Pichu unlocks a special and exclusive Spiky Eared Pichu event in Ilex Forest. Now, some additional information is the Gamestop Jirachi. 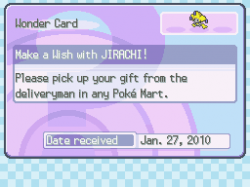 The Jirachi is also included on the distribution cart with Pichu, just like Regigigas was on the Shaymin cart last year. It will be distributed from February 27, 2010 to March 13, 2010. 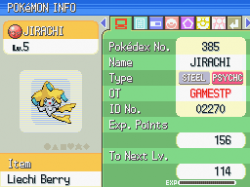 And since we have the Pichu early, that means we have the Jirachi early too. The details for the Jirachi are the following. The OT is GAMESTP and the ID is 02270. It is random natured at level 5. It is holding a Liechi Berry and is captured in a Cherish Ball. Nintendo America have today announced that those who pre-order Pokemon HeartGold and SoulSilver in the US will receive a special bonus. Just like in Japan, people who pre-order from a selection of retailers including Gamestop will receive a small Lugia figure for pre-ordering SoulSilver and a Ho-Oh figure for pre-ordering HeartGold, pre-order both to get both. March 25th release in Australia and a March 26th release in Europe.